The late Roger Palmer, a passionate lover of animals and founder of the UKWCT, visited Alaska in the 1970s. There he encountered wolves for the first time and upon his return to the UK decided to acquire a wolf himself. He obtained his first wolf later that year from Kessingland Park in Norfolk at only a few days old. 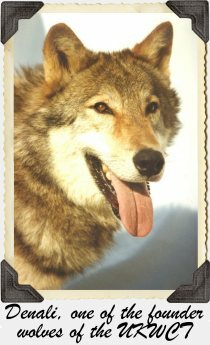 As with all the wolves Roger kept, this first wolf called “My Lady” was hand reared, thereby becoming exceptionally friendly and tolerant to everyone, including children, all her life. 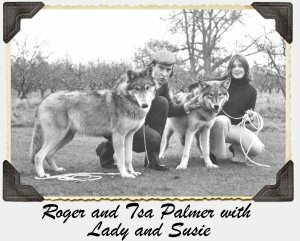 Thereafter Roger and his wife Tsa kept wolves as private individuals for many years, first at Dorney in Buckinghamshire and later moving them to Butlers Farm in Beenham in 1983. They had some 15 wolves during this period – usually two or three at a time. The more they learned about wolves the keener they were to dispel the myths and misconceptions that surround them. Encouraged and inspired by Dr Erich Klinghammer, the founder of Wolf Park in Indiana, Roger and Tsa were persuaded to form the UK Wolf Conservation Trust in 1995. The Trust was set up as a member organisation from the outset. Wolves provoke an emotional response in many people, even in a country that has no longer has them as an indigenous species. Our relationship with wolves is complex and fascinating and the symbolism of wolves taps deep into the human psyche. Attracting members to the Trust was not the difficult part. Controlling the operational issues of "walking with wolves" was trickier in the early days. Today there are over 2,500 members, but there are also a lot more volunteers to help cope with the increasing pressures and demands. The Trust is a not-for-profit organisation run by its four Directors with two full time and two part time members of staff, as well as over 70 volunteers, and some notable Patrons. • To enhance the conservation, scientific knowledge and public awareness of wolves and their habitat and to this aim we give funds to projects around the world. • To provide opportunities for ethological research and for people to interact with wolves. • To improve the chances of survival of wolves in the wild. • To run education programmes for schools, conservation and other organisations. Having acquired some more land adjacent to their house from the neighbouring farmer, Roger and Tsa with a group of volunteers set about building three new large enclosures. The founding ambassador wolves of the Trust were Denali, Kodiak and Kenai – all sadly have passed away now. 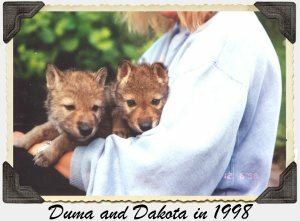 They were followed by the younger siblings of Kodiak and Kenai, namely Duma and Dakota, who were born in 1998 from the same parents, Monty and Epsom, out of a long line of North American wolves who were bred at Woburn Safari Park over a period of about 30 years. In 1998 the Trust imported three European Wolves Apollo, Athena and Luna from Eastern Europe. They were quarantined at the Trust and much to our delight Luna and Apollo were seen mating in February 1999, the result of which was the birth of 6 cubs (two were dead at birth) on 3rd May 1999. This was reported to be the first birth of European wolves in the UK since they were extirpated from England in the 1500s (this was researched by the BBC reporter who came to the Trust at the time - an astonishing achievement). The Trust kept three of the cubs, Alba, Lunca and Latea. The remaining cub Luana was given to Paradise Wildlife Park. Athena went to a wildlife park in Norfolk and Luna and Apollo were given to Wildwood in Kent where they went on to have more cubs in later years. Thus we had both European and North American wolves at the Trust for visitors to see. By now, three new large enclosures had been built and through the hard work of our team of dedicated volunteers, who give their time and skills freely, trees were planted and mounds and other features were added. The wolves had much more space and we had achieved our aim of providing interesting and spacious habitats for them all. A building was erected which was later to become our Education Centre which has an observation window into one of the enclosures. Other facilities such as toilets, a food shed and portacabin for volunteers were added. Then a huge setback occurred, Roger who had been ill for a long time with a brain tumour died in March 2004. The Trust however carried on under the leadership of Tsa with a number of key volunteers. The emphasis of the Trust from this stage onwards has been education. We run a wide range of events and activities to promote conservation in all its facets to school children of all ages. We also run howl nights, wolf keeper days and provide interesting and rewarding work experience opportunities for college and university students. We offer opportunities for other people to carry out ethological research at the Trust and in 2006 we started a student exchange scheme with a large carnivore project in Bulgaria. In 2005 Tsa Palmer acquired another 23 acres of adjacent farmland which enabled the Trust to have the use of 50 acres. Nature trails have been added and ponds dug and the wolves are able to enjoy walking over this farmland. It has meant also that the Trust is able to have open days with space to park the extra vehicles of the many visitors. Other animal exhibits are included on these days such as birds of prey as well as numerous activities for children. In 2006 the Trust was lucky enough to be given Torak, a male European / North American wolf cub born at the Anglian Wolf Society. Torak was surplus to their requirements. Through his father Cheza, Torak is directly related to our former European wolves. He was joined at the Trust a few days later by Mosi, Mai and Mika three cubs who were abandoned at birth by their mother at the Dartmoor Wildlife Park. Mika, who was the weakest of these three cubs, and had received none of her mother’s first colostrum, sadly died at three weeks old. The remaining two Dartmoor wolves, Mosi and Mai, now live with Torak and Motomo respectively. Motomo came to us from Combe Martin as a companion for Mai and in May 2011 they had cubs - Nuka, Tundra and Tala, the Beenham Pack. In June 2011 three Arctic cubs (Sikko, Pukak and Massak) were imported from Canada and they were the first of their kind in the UK. Thus in the twenty-second year since the founding of the Trust, our focus is as much as ever on raising awareness and education about wolves. This is achieved through the international network of contacts and through work with schools, colleges and universities in the UK. The Education Centre at the UKWCT provides a base for this work and for students to use as a facility for their research into wolf behaviour, ethology and conservation. Since 2005 we have managed to send over £338,000 to support wolf projects in Armenia, Greece, Bulgaria, Croatia, Ethiopia, France, India, Iran, Israel / Syria,Morocco, Nepal, Portugal, Spain, Russia and the USA as well as building up a fund should the wolves ever have to move from Beenham in the future.